For two centuries, the geographic concentration of oil, natural gas and coal reserves has helped configure the international geopolitical landscape. Coal and steam power drove the Industrial Revolution which, in turn, shaped geopolitics in the 19th century. Since then, control over the production of and trade in oil has been a key feature of 20th century power politics. A transition from fossil fuels to renewable energy could transform global power relations no less than the historical shifts from wood to coal and from coal to oil. A state’s relative position in the international system is influenced by a range of attributes, including its GDP, population, land size, natural resources, geostrategic location, military resources, and ‘soft power’. Having control over and access to significant energy resources and markets is an important asset because it enables states to protect vital national interests at home, and leverage economic and political influence abroad. States without such assets, by comparison, have less leverage and are more vulnerable. The rapid growth of renewable energy is therefore likely to alter the power and influence of some states and regions relative to others, and to redraw the geopolitical map in the 21st century. How different countries fare in the context of the energy transition depends in no small part on how exposed they are to changes in fossil fuel trade flows. Equally important is their position in the clean energy race, the commercial race to become a leader in renewable energy technology. Although the issue is highly complex, innovation will be a key determinant of the pace of change and its effect can be illustrated in Figure 4. The Y-axis depicts the share of oil, gas, and coal imports in total primary energy consumption in 2017. It situates selected countries, as well as the European Union, in the energy economy of today, which is dominated by fossil fuels. The higher the share, the more dependent a country is on fossil fuel imports. Net fossil fuel exporting countries have negative shares. The X-axis shows the cumulative number of patents for renewable energy technologies that had been registered by the end of 2016. This indicator provides a way to assess the position of selected countries, and the European Union, in the clean energy race. Countries and groupings in the upper right quadrant of Figure 4 stand to gain the most from the energy transition: they are highly dependent on imported fossil fuels but have positioned themselves at the forefront of the clean energy race. Figure 4 gives rise to a number of observations. The United States is close to energy self-sufficiency, largely due to the shale revolution. It became a net exporter of natural gas in 2017 and is projected to become a net oil exporter early in the 2020s. The US is well positioned in the clean energy race: US companies hold strong positions in new technologies, including robotics, artificial intelligence, and electric vehicles. China will gain from the energy transformation in terms of energy security. It has a leading position in manufacturing, but also in innovation and deployment of renewable energy technologies. It is the biggest location for renewable energy investment, accounting for more than 45% of the global total in 2017.43 Currently, it remains highly dependent on oil imports which have been growing steadily. 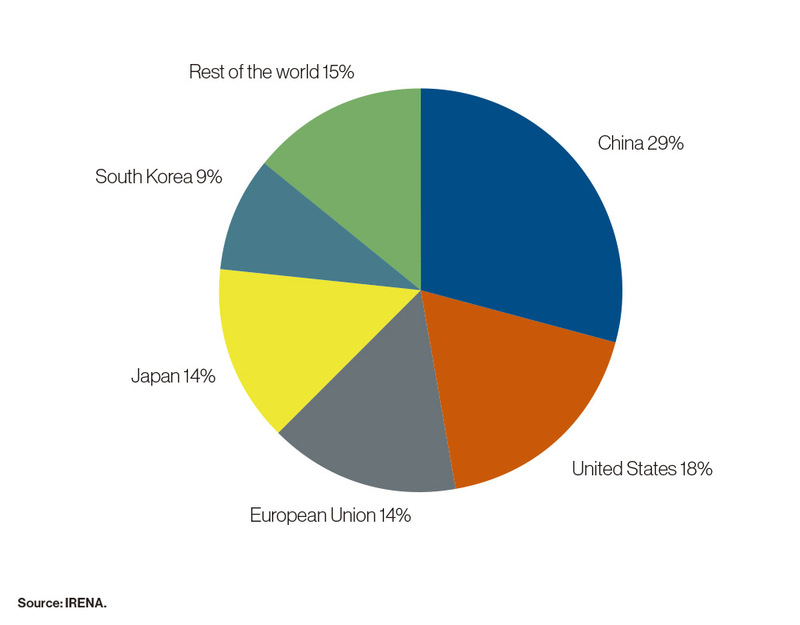 Europe and Japan are major economies which are very dependent on fossil fuel imports. They also hold strong positions in renewable technologies. In Europe, Germany leads the way with almost 31,000 renewable energy patents. Germany’s domestic Energiewende, or ‘energy transition’, has made the country a frontrunner in renewable energy deployment. Russia, the world’s largest gas exporter and second largest oil exporter, may face challenges in adapting to a world increasingly powered by renewables. Russia’s economy is larger and more diversified than any of the Middle Eastern oil producers, but oil and gas rents are a vital component of the state budget, accounting for around 40% of fiscal revenues.48 Even though Russia is stepping up renewable energy deployment and is investing in research and development, it still lags far behind China and the US in terms of patents for renewable energy technologies. To assess the impact of the energy transition on different regions, Figure 5 shows each region’s net fossil fuel exports and imports as a share of GDP. While the graph above masks differences within regional groupings, it has the advantage of uncovering major differences between regions and country groupings. The Middle East and North Africa, together with Russia and other countries in the Commonwealth of Independent States (CIS),49 are the regions most exposed to a reduction in fossil fuel revenues. 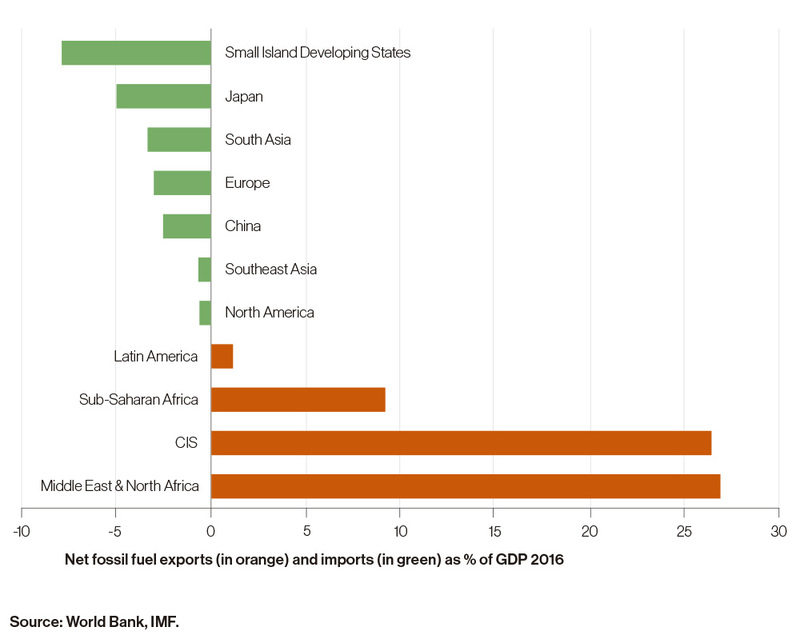 On average, these regions have net fossil fuel exports of more than a quarter of their GDP. Declining export revenues will adversely affect their economic growth prospects and national budgets. To prevent economic disruption, they will need to adapt their economies and reduce their dependence on fossil fuels. The majority of countries in Sub-Saharan Africa (SSA) will benefit from reducing fossil fuel imports and generating renewable energy domestically, because this will boost job creation and economic growth. The exceptions to this are the two biggest oil producers in the region, Nigeria and Angola, which are at risk because they depend heavily on fossil fuel rents. Because of their size and large fossil fuel exports, they skew the data for SSA as a region. In the long-term, however, African countries have a unique opportunity to leapfrog the fossil fuel-centred development model despite recent discoveries of oil and gas. Small Island Developing States (SIDS) will benefit most of all if they adopt renewable energy sources rather than fossil fuels. The import of fossil fuels now amounts to 8% of their GDP. Many SIDS are also extremely vulnerable to the effects of climate change. SIDS possess ample renewable energy sources and renewable technologies can meet most of their domestic energy needs. The shift would cut import bills, promote sustainable development, and increase their resilience. International cooperation to support SIDS’ renewable energy ambitions is growing substantially, and 13 SIDS have established 60-100% renewable electricity targets. South Asia spends more than 3% of its GDP on imports of fossil fuels, and demand for fossil fuels is rising rapidly from a low base. These countries will benefit from the energy transformation primarily by reducing their fossil fuel import bills, which would otherwise grow dramatically and weigh on their economies. Europe, China and Japan are currently heavily reliant on fossil fuel imports but would increase their energy independence as renewable energy shares grow. Japan is the most dependent; its net fossil fuel imports amount to 5% of GDP. North America and Latin America are net neutral when combined. On a continental scale, in light of both their domestic resources and international trade in energy, their economies are largely energy independent. Countries that have historically enjoyed geopolitical influence because they supply fossil fuels are likely to see a decline in their global reach and influence unless they can reinvent their economy for a new energy era. Many fossil fuel-rich countries are able to project considerable international power. They can employ their fossil fuel rents (the difference between cost of production and market price of fossil fuels) to finance socio-economic development and economic diversification, significantly strengthen their military capabilities, or invest in foreign assets such as US securities. The energy transformation is expected to put pressure on fossil fuel prices and related rents.50 If fossil fuel revenues decline, these countries will need to rethink their national priorities and strategies. 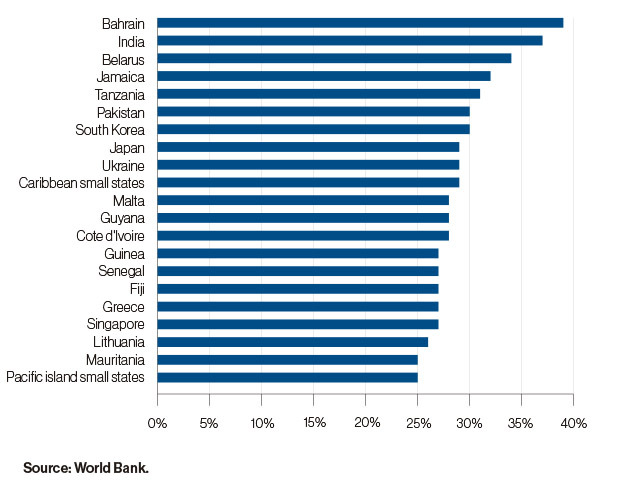 Figure 6 lists countries that derive much of their GDP from fossil fuel rents. Figure 6 shows clearly that oil rents have generally been much larger than natural gas rents and coal rents. Among the countries whose fossil fuel rents amount to over 10% of GDP, natural gas rents are higher than oil rents in only three: Turkmenistan, Uzbekistan, and Trinidad and Tobago. 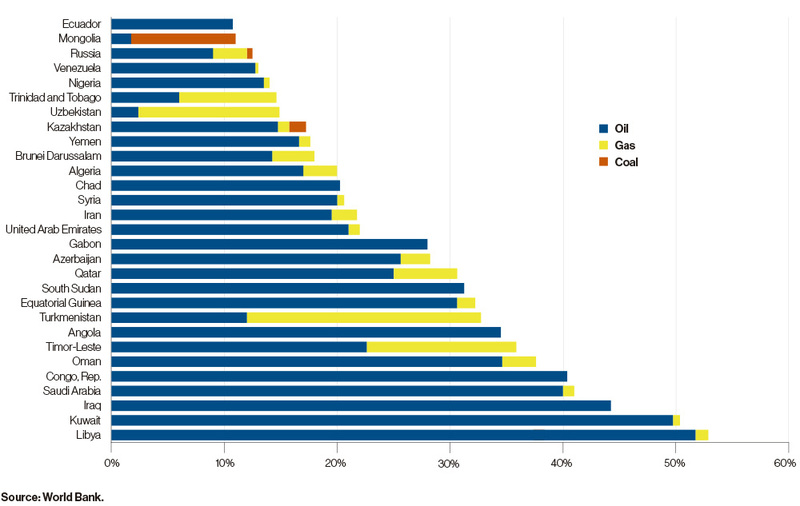 In just one country, Mongolia, coal rents are the highest fraction. In all other countries, including large gas exporters such as Russia, oil rents dominate. A decline in fossil fuel rents has the potential to profoundly destabilize countries that have not prepared their economies sufficiently for the consequences. The loss of oil rents in countries with weak governance could lead to fractures in society and political instability. The drop in oil price in the 1980s was one of the factors that contributed to the decline and eventual fall of the Soviet Union, which in turn led to the end of the Cold War, arguably the biggest geopolitical shift since the end of the Second World War. These countries are highly dependent on fossil fuel rents, which typically account for more than 20% of their GDP. They also lack resilience because their per capita GDP is low and they have limited financial buffers. The countries in this group include Libya, Angola, Republic of Congo, Timor-Leste, and South Sudan. These countries are highly dependent on fossil fuel rents but have sufficient income and capacity to be able to reinvent themselves and adapt to the energy transition. They include Gulf states, such as Saudi Arabia, Qatar, Kuwait, and the United Arab Emirates (UAE), and Brunei Darussalam. 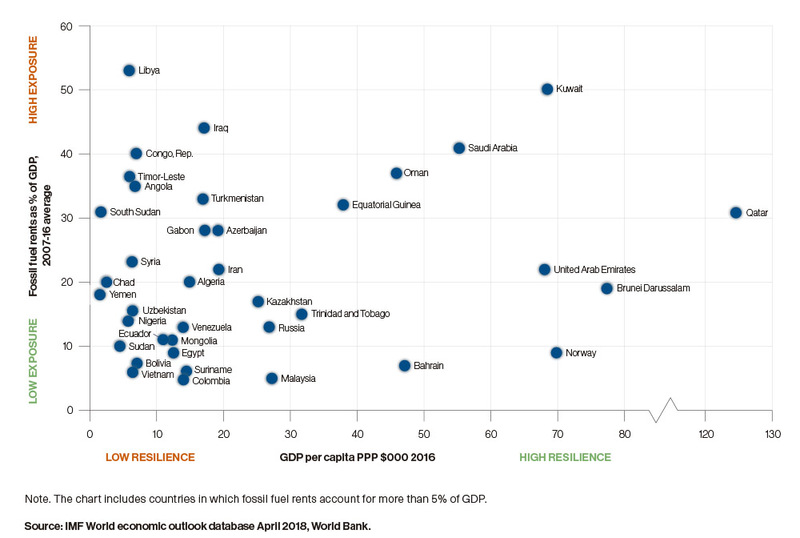 These countries are quite exposed, but their economies are moderately resilient. As a result, they should be able to manage the transition, provided they implement effective policies to diversify their economies. This group includes Russia, Iran, Algeria and Azerbaijan. Fossil fuel rents in these countries are less than 10% of GDP so they should be less vulnerable to the energy transition. This group includes Malaysia, Bahrain, Colombia and Norway. The loss of oil rents may cause painful adjustments in the short term. In the long run, however, fossil fuel-driven economies have the opportunity to reduce the risks posed by oil dependence, and create a more stable, equitable and productive economic future for their peoples. Studies show that large oil rents can undermine growth, distort the economy, capture democratic institutions, stimulate corruption, impede the development of domestic industry, and aggravate conflict.56 While most of these adverse effects can be avoided through good governance, the rule of law and sound policies,57 they nevertheless remain a significant risk for many oil-rich states. In recent years, in recognition of the new reality, several oil exporting countries have developed plans to diversify their economies and increase their resilience (see Table 1). Oil- and gas-rich states will derive many benefits from diversifying their economies. They will strengthen their long-term growth prospects and shield their economies from the vagaries of international commodity prices, a key source of macroeconomic volatility.59 An open economy and competitive private sector will generate more sustainable growth. They will also create more productive jobs, an important priority in countries where large numbers of young people are unemployed. Finally, diversification will help to prepare these countries for the looming peak in oil demand. United States and the Middle East for decades.62 Similarly, China’s need to secure oil supplies and other natural resources to sustain its growth has led it to foster new and deeper ties with countries in Asia, Africa and Latin America, as well as diversify its domestic energy supply with renewables. In a renewable energy economy, most countries will be able to achieve energy independence: they will have greater energy security and more freedom to take the energy decisions that suit them. Since some form of economically viable renewable energy potential is available in most places, countries that currently depend heavily on fossil fuel imports will be able to use renewables to reap strategic and economic benefits. In strategic terms, fossil fuel importing countries are vulnerable to risks of supply disruption and price volatility caused by political instability, terrorist attacks, or armed conflicts that may occur in oil- and gas-exporting nations. Smaller energy-importing countries may also be subject to pressure or coercion with regard to their energy supply and therefore have less freedom to determine their own strategic priorities and goals. By contrast, countries that are able to develop their own renewable sources of energy are better placed to achieve energy security. An example is the Brazilian ethanol programme which was put in place after the oil shock of 1973 to reduce the country’s oil imports and shield the economy from volatile prices and supply disruptions. This programme has played a vital role in Brazil’s efforts to achieve energy self-sufficiency and has helped transform it into the world’s second largest producer and largest exporter of ethanol. In economic terms, a high degree of import dependence also generates costs and risks. Countries that import most of their energy are exposed to currency fluctuations and volatile fuel prices that can result in balance-of-payment problems. The oil price shocks in the 1970s, for example, squeezed many industrial economies and sowed the seeds of a debt crisis that many developing countries suffered in the decade that followed, with serious social and economic consequences. Increasing the share of renewables in the energy mix can mitigate such risks and provide new pulses of economic growth. Fossil fuel imports can also impose a huge burden on the trade balance of some importing countries. Data from the World Trade Organization (WTO) indicate that in 2015, despite a significant drop in oil prices, the global cost of gross fossil fuel imports was 1.9 trillion US dollars.65 Figure 8 shows that Bahrain, India, Belarus, Jamaica, Tanzania, Pakistan, and South Korea were among the countries most dependent on fossil fuel imports. Countries such as Chile, Jordan and Morocco are also reducing their dependence on energy from abroad, in order to enhance their energy security and correct the structural trade imbalances that energy imports exacerbate. Morocco currently imports over 90% of the energy it consumes.72 It plans, however, to exploit its consistent sun and strong winds to reduce these imports and eventually become a net exporter of electricity to European and African markets. It has set a target of 52% renewables in its electricity mix by 2030. Energy independence does not imply complete self-sufficiency or autarchy.73 Even if a country is able to generate renewable energy, it will not necessarily choose to do so because it will focus on its comparative advantages. Even when a country’s energy needs are supplied entirely from home-grown sources, it will still benefit from international value chains and trade in technologies, goods and services. Increasing energy security through renewable energy deployment may change the dynamics between energy exporters and importers. It will also diminish the role of oil and gas in international politics. Ensuring the security of energy supply becomes more a matter of domestic governance, rather than an international security priority. Countries that achieve energy independence will also be less vulnerable or beholden to their suppliers and will therefore be able to pursue their strategic and foreign policy goals more independently. Countries that are able to take advantage of new renewable energy technologies can expect to enhance their global influence and reach. Three types of countries have the potential to emerge as new renewable energy leaders. First, countries with high technical potential for renewable energy generation stand to gain if they are able to become significant exporters of renewable electricity or fuels. Australia’s economically demonstrated solar and wind energy resources are estimated to be 75% greater than its combined coal, gas, oil and uranium resources.74 In the Atacama Desert, Chile has among the world’s best solar resources, as well as high potential for wind, hydropower, geothermal and ocean energy. In both cases, however, the remoteness of these locations will probably constrain electricity exports. Second, mineral-rich countries such as Bolivia, Mongolia, and the Democratic Republic of Congo (DRC) have an opportunity to become part of the global production and value chains necessary for renewable technologies. Doing so will boost their economic development, provided they put the right policies and governance frameworks in place. Third, leaders in technological innovation are positioned to gain the most from the global energy transformation. No country has put itself in a better position to become the world’s renewable energy superpower than China. In aggregate, it is now the world’s largest producer, exporter and installer of solar panels, wind turbines, batteries and electric vehicles, placing it at the forefront of the global energy transition. Figure 9 shows the total clean energy manufacturing value added by four technologies: wind turbine components, crystalline silicon PV modules, LED packages, and lithium-ion battery cells. 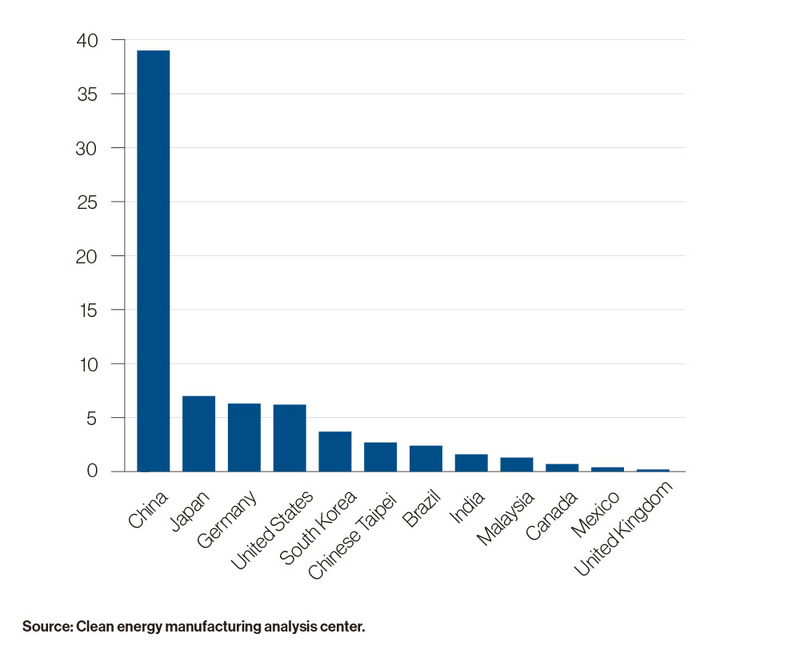 It confirms that China is by far the largest global manufacturer of these clean energy technologies. 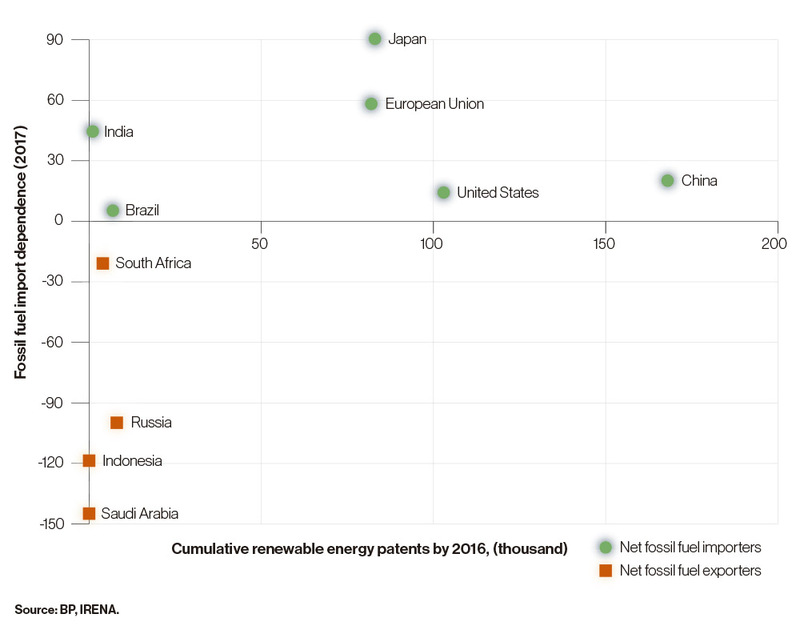 In addition, it leads the world in renewable energy patents (see Figure 10). China’s concerted efforts to research, develop and invest in renewable energy and clean transport offer its industry the opportunity to overtake US and European companies, which have been dominant in sectors such as cars and energy machinery. This will give China a comparative advantage in trade and lend impetus to the country’s economic growth. By taking the lead on renewables, China has improved its geopolitical standing in several respects. By producing more of its own energy, China is reducing its reliance on fuel imports and the risks of energy disruption which could put a brake on its economic ambitions. Its technological expertise in renewables has established it as a leading exporter of clean energy technology, creating a balance of trade advantage. The clean energy technology race could result in a situation of technology dominance. In some respects, that outcome can already be seen in mobile technology where a few companies (Huawei, Samsung, Apple) compete for global leadership. If a small number of players were to dominate clean energy technology in a similar way, it would raise concerns that concentration could stifle competition, suppress innovation, and distort markets. Countries that do not control key energy technologies may become heavily dependent on the few countries and companies that do. In this context, industrial policy becomes increasingly important; countries will need to create a competitive manufacturing value chain around certain technologies within a fair and rules-based trading system. Apart from the risk of technology dominance in specific areas, renewable energy leaders are unlikely to gain the degree of market dominance that fossil fuel leaders have enjoyed, due to the ubiquitous nature of renewable energy sources. The shift to renewable energy may reshuffle political and economic power, because renewables tend to decentralize and democratize energy systems. Due to the falling cost of solar PV and wind power, as well as smart distribution systems, almost anyone with a rooftop or some land can produce electricity, either for self-consumption or for the grid. These developments will generate a more diverse energy ecosystem. The role of the centralized state in the energy system may change, while many new actors and new business models are likely to emerge and flourish. Local and distributed forms of energy generation give households and communities more autonomy than centralized grid systems. As more people install solar panels, batteries and smart software, formerly passive consumers of electricity may become consumers and producers of electricity in an interconnected grid. Innovation in market design and smart grid technologies, including storage, permit stable management of variable renewable electricity on the grid. Advances in communication technology may lead to the emergence of an ‘energy internet’, allowing hundreds of millions of people to produce electricity in their homes, offices and factories and share it peer-to-peer.77 The number of grid-connected smart devices is projected to rise from 26 billion in 2017 to over 75 billion by 2025, enabling intelligent demand side management.78 In this new world of ‘prosumers’, energy assets will no longer be owned exclusively by centralized utilities or the state. Cities occupy a central role in the energy transformation. By the middle of this century, 70% of the world’s population is expected to live in cities.81 Cities consume around two-thirds of generated energy and produce 70% of the world’s carbon emissions. They are also especially vulnerable to the effects of climate change, including coastal flooding and urban heat island effects.82 At the same time, they have the means to shape the new energy landscape. By 2030, the fifty largest cities will have a bigger economic footprint than many small- and medium-income countries, making them major economic and political players on the international stage in their own right. Cities and local municipalities are also forming global alliances and networks, including C40, ICLEI and the global covenant of mayors.86 Together with the actions of other non-state actors, such as California’s Global Climate Action Summit of September 2018, they are adding a new layer of global governance that is driving action to achieve decarbonization, sustainability, and greater resilience through renewables. There is ample evidence that private corporations are responding to the realities of the energy transformation by restructuring and adjusting, and increasing renewables generation. Following dramatic declines in market capitalization, Germany’s largest utility companies, RWE and E.ON, both split their businesses into two parts, one focused on renewables and the other on thermal generation. Danish Oil and Natural Gas (DONG) changed its name to Ørsted after selling off its oil and gas business. Total is diversifying into solar and battery technology. Shell is growing its natural gas portfolio relative to oil. 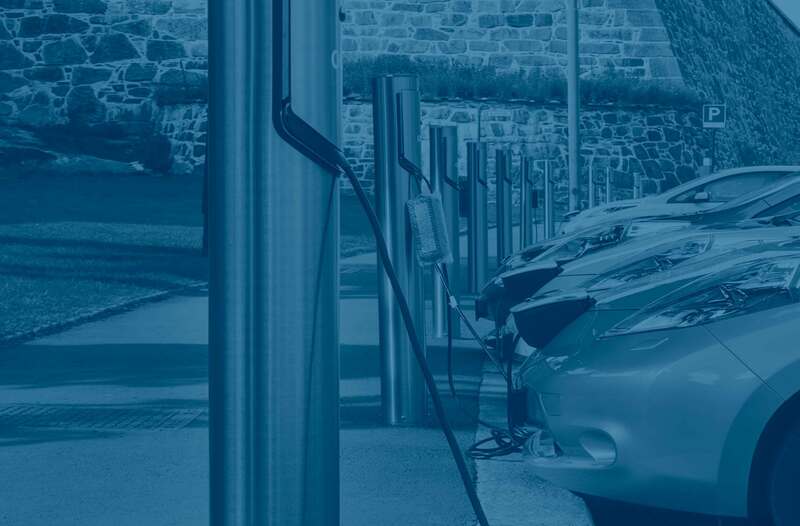 BP and other oil companies are buying into electric vehicle charging infrastructure. In 2017, barely seven years after its initial public offering, Tesla became the most valuable US car maker, overtaking General Motors, a company over one hundred years old. Some global technology companies already source 100% of their electricity from renewable energy.87 These trends indicate that global technology companies are becoming important players in the new energy landscape. In short, the renewable energy transformation goes hand in hand with a dispersion of power. The modern nation state and the fossil fuel economy have evolved alongside one another. The decline of the fossil fuel era and the advent of decentralized power generation in an increasingly electrified world may have profound implications for the role of the nation state. Renewable energy will not merely influence the balance of power between countries. It will also reconfigure alliances and trade flows, and create new interdependencies around electric grids and new commodities. If global demand for fossil fuels declines, alliances built on fossil fuels are likely to weaken. Alliances may be maintained for various other reasons, but the energy pillar will become relatively less important. The Organization of the Petroleum Exporting Countries (OPEC) is a prime example of a fossil fuel-based grouping. It was created in 1960 as a forum for oil-exporting countries to exchange information and coordinate their interactions with the international oil companies that dominated international oil trading at the time. OPEC countries started to coordinate their oil production policies from the early 1980s. OPEC has displayed enormous resilience to shocks, including a range of price crises and conflicts between and within member countries. The current cooperation between OPEC and non-OPEC countries, underpinned by the rapprochement between Saudi Arabia and Russia despite their differing geopolitical priorities, can be understood as an attempt to sustain the organization in the face of rising US shale production. OPEC might reinvent itself in some guise; nevertheless, in a world that has a growing range of energy alternatives, it is likely to decline in importance.88 Qatar’s recent decision to leave, to focus more on export of natural gas, illustrates the challenge that OPEC faces amid rapid and structural changes in the market. Bilateral relations between states will also undergo change. The alliance between the United States and Saudi Arabia is a prime example of a strategic relationship in which oil plays a key role. This alliance dates back to 1945, when King Abdul Aziz ibn Saud and US President Franklin D. Roosevelt came to an understanding that the US would provide military assistance in exchange for access to Saudi oil. Relations between the two states may evolve significantly as economies across the globe become less dependent on oil. Countries are also beginning to rethink their energy diplomacy. The foreign energy strategy of Japan no longer concentrates exclusively on securing fossil fuel imports but also includes renewables,89 hydrogen in particular.90 Germany spearheaded the creation of IRENA in 2009 and has developed bilateral energy partnerships with a number of countries in which renewable energy features prominently.91 The United Arab Emirates (UAE), a major oil-exporting country, has also assumed a leadership position on renewable energy by hosting IRENA, funding renewable energy projects in developing countries via the Abu Dhabi Fund for Development,92 and investing in renewable energy projects in developed countries. Several new alliances and initiatives are emerging to promote multilateral cooperation and boost specific renewable technologies. The Paris 2015 climate conference alone gave birth to the International Solar Alliance,93 the Global Geothermal Alliance,94 and Mission Innovation.95 Initiated by governments or intergovernmental entities, these bodies bring together countries, private sector actors and non-governmental organizations to accelerate the adoption of renewables. Renewables will configure new geographies of connections and dependencies between countries and regions. In broad terms, the weight of energy dependence will shift from global markets to regional grids. Countries that today import oil from the other side of the world will seek to develop renewables at home and to integrate their grids with those of neighbouring countries. The transition to renewable energy will put electricity centre stage. Unlike oil and liquefied natural gas (LNG), which are traded globally, electricity is currently a regionally traded commodity. With current technology, much electricity is lost when it is transported over long distances. Global energy markets are therefore likely to become more regional. Innovations in ultra-high-voltage transmission that minimize losses could nevertheless help to enhance trade in electricity over longer distances. Trade in fossil fuels currently accounts for almost 15% of all merchandise trade.98 If less fossil fuel is traded, more of the energy-related trade that persists will be in renewable energy technologies and electricity rather than fuels. Exceptions to this may include fuels such as hydrogen (generated both by renewables and conventional energy), synthetic fuels, and biomass (see Box 1). Unlike trade in fossil fuels, trade in renewable energy technologies would be shaped by ‘normal’ rather than ‘natural’ comparative advantages. A country has a natural comparative advantage when it has natural resources (such as oil fields) that are required to extract or produce a product. Since renewables are much less geographically concentrated, a country will specialize in those aspects of renewable energy trade in which it has a comparative advantage based on factors such as technology, relative price, and cost of transport. 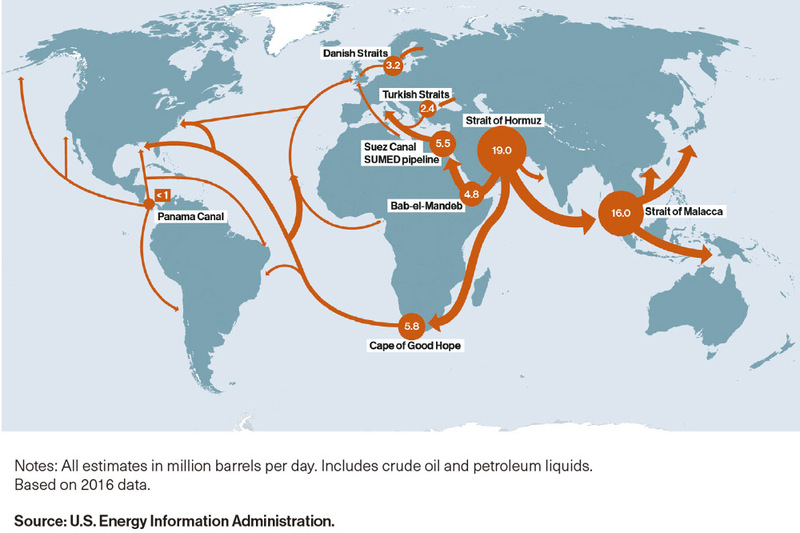 As energy trade routes redraw themselves, the geopolitical map will take new forms. In a world in which energy can be produced at most locations, a single hegemon will be less able to exert influence by controlling the high seas or strategic chokepoints such as the Straits of Hormuz or Malacca. Some maritime trade routes will therefore become relatively less important. Trade in renewable energy-related goods and technologies. These include a wide range of goods and technologies, from solar PV panels to smart meters and batteries, as well as their components and parts (for example, blades for wind turbines or water wheels for hydropower) and related services (for example, engineering and installation services). Electricity trade will increase because additional interconnections make grids more stable and resilient. Variable renewables, such as solar and wind power, require flexible and interrelated power systems that can balance supply and demand in real time. Electricity interconnections can be made between neighbouring countries, at a regional scale and possibly even inter-continentally. While the potential to increase trade exists, the number of trade disputes related to renewable technologies has grown in recent years. Trade in renewable energy goods may be hampered by tariffs, discriminatory subsidies, and conflicting technical standards. Members of the WTO have started negotiations to open trade in environmental goods and services further. In the future, consideration will need to be given to governance issues, particularly standards and rules, to ensure a level-playing field in renewable energy trade. Given the range and ambition of these developments, infrastructure links and the internet may become new battlegrounds for influence and control between competing powers. They may also serve as a geopolitical glue, bringing nations and their citizens closer together in new interdependencies. To emerge and endure, a networked community needs a high degree of confidence and trust; but, once established, physical and human interconnections can become conduits for cooperation and coexistence, as well as stability and prosperity. States have long used energy resources as instruments of foreign policy, a practice known as energy statecraft. In a world powered mostly by renewables, energy resources will lose much of their currency as geopolitical instruments. In the words of former US President Jimmy Carter: “No one can ever embargo the sun or interrupt its delivery to us”. At the same time, a reliance on other commodities, such as electricity, biofuels, emerging fuels like hydrogen, or critical materials, could create new forms of dependence and vulnerability. One possible consequence of the energy transformation will be to reduce the geostrategic importance of oil and gas as tools of foreign policy. On occasion, countries have intervened in oil and gas markets to further their foreign policy goals.108 One way in which they have done this is through supply embargoes. In October 1973, for example, member countries of the Organization of the Arab Petroleum Exporting Countries (OAPEC) declared an oil embargo against some Western states in the wake of the Arab-Israeli conflict. Another example is the oil embargo against apartheid-era South Africa. Some countries have also put embargoes in place to leverage pressure on oil exporters. The US government’s re-imposition of oil sanctions against Iran, after President Trump’s decision to withdraw from the 2015 Iran nuclear deal, is a recent example. Some sanctions do not curtail a country’s current exports, because doing so would raise global prices and inflict equal pain on consuming countries. Instead, sanctions are targeted to hinder development of future production capacity. This approach underpinned the oil sanctions that Western states and Japan imposed on Russia in 2014. Countries have sometimes tried to exert geopolitical influence, not by withholding supplies of oil and gas or by raising their price unilaterally, but by doing exactly the opposite. After oil prices fell dramatically in 2014, for instance, OPEC did not move to cut production because it preferred to maintain its market share in the face of growing US shale production. Oil and gas have not only been used as ‘sticks’ to hurt or deter foes, but also as ‘carrots’ to reward allies and ensure their allegiance. Venezuela’s Petrocaribe scheme, for example, granted large discounts on crude and oil product deliveries to small Caribbean states in an effort to counter US influence in the region. It is not just the energy resources themselves which have been the object of geopolitical competition, but also their transit routes. In the 1990s, for instance, the US promoted the Baku-Tbilisi-Ceyhan (BTC) pipeline to bolster its strategic influence in the region at the expense of Russia and Iran. For more than a decade, the EU has supported the construction of a Southern Gas Corridor to reduce its reliance on Russian gas, while both Russia and some European countries have promoted alternative gas corridors, such as Nord Stream, to circumvent existing transit routes. The spread of renewable energy will increase electrification and stimulate cross-border trading in electricity. Variable renewable sources of electricity, including wind and solar, require flexible power systems that are able to cope with fluctuations of demand and supply in real time. Innovations in market design, smart grids, and storage technology, together with high-voltage direct current electricity interconnections between countries, can effectively meet this need for flexibility. Notably, however, electricity trading tends to be more reciprocal than trade in oil and gas. Whereas oil and gas flow in one direction, from an exporter to an importer, the trade in electricity between countries flows both ways. A country that generates solar power may import energy from a neighbouring country when it rains, but export energy to that neighbour when the sun shines. Unlike trade in natural gas, which requires a fixed transportation infrastructure such as pipelines or LNG terminals, the relationship between sellers and buyers of electricity is less exclusive. When Russia cut off gas supplies to Ukraine in 2009, hitting consumers downstream in Europe, European states had limited access to substitutes for Russian gas. In the future, however, as more countries produce clean electricity and build interconnections, they are unlikely to be caught out by a boycott because they will be able to produce more electricity locally or to import it from a variety of alternative sources. Even if an exporter of renewable electricity acquires a dominant position with respect to an importing country, that asymmetry cannot easily be used as an instrument of geopolitical pressure. This is because countries will have alternative options at their disposal: they can either produce the electricity themselves, for instance by deploying renewable energy at home, or import electricity from neighbouring countries.110 As a result, renewable energy exporters will always be part of a complex web of interdependencies between importers and exporters that would tend to curtail the potential to use renewable electricity as a geopolitical weapon. To govern cross-border grids, governments will need to develop appropriate arrangements to enable electricity to flow freely in well-regulated and transparent markets.115 Examples already exist. In Europe, the EU Agency for the Cooperation of Energy Regulators (ACER) helps to ensure that the single European market in electricity functions properly. IRENA’s Clean Energy Corridors (CEC) initiative, which is incorporated in NEPAD’s Programme for Infrastructure Development in Africa, promotes cross-border trade in electricity across energy markets.116 The Continental Free Trade Area which is being developed in Africa also provides new opportunities for regional and sub-regional integration and interconnections. Biofuels have become important commodities in world markets, particularly since 2006, and are part of the energy transition strategy of some countries. Ethanol has been traded globally in significant volumes for decades. Biodiesel trade is less established and continues to consist primarily of trade in feedstocks (such as soya beans and vegetable oil) rather than fuel.117 Some concerns have been raised about the environmental impact of biofuels and the potential conflict between biofuels and food, but many countries are taking steps to address this, including through the development of next-generation biofuels based on crop residues or algae. Some feedstocks (such as sugar cane) are non-tradable or perishable. Only a small proportion of biofuels is traded internationally. The biggest producers of biofuels are also the biggest consumers. Tariff and non-tariff barriers continue to hamper market access in a number of countries. Renewable technologies and batteries require certain minerals for their production, such as cobalt, lithium, and rare earth elements.119 Some fear that countries which have rich endowments in these critical minerals may use them to exert pressure on countries that lack them. This view was given credence in 2008 when China restricted the supply of rare earths to foreign buyers. Markets panicked and international prices soared, because China controlled a substantial part of the global supply of rare earth minerals. In fact, most of the 17 rare earth minerals are not geologically rare. They are abundant and widely distributed, though they are expensive and polluting to mine and produce. This is partly why the US has refrained from contesting Chinese predominance over rare earth production since the 1990s. These factors combine to make it unlikely that cartels will emerge to control these critical materials. Cartels are hard to form and sustain. In the 20th century, oil was the only major commodity whose price did not fall in real terms, even though cartels were active in tin, coffee, sugar, and rubber. International trade rules also impede cartelization. In 2014, the US, Japan and the European Union appealed to the WTO and successfully challenged China’s decision to restrict the export of rare earths. In sum, the energy transformation driven by renewables will provide fewer instances of ‘energy statecraft’, the use of energy resources as an instrument of foreign policy. Electricity, biofuels and other materials critical to the new energy system are unlikely to acquire the geopolitical role and weight of oil and gas. The pivot to renewables could reduce the incidence of certain kinds of conflict, and alleviate competition for important natural resources, notably oil, gas, water, and food. On the other hand, cybersecurity and access to important minerals may generate increased concern and tension. The push into renewables is driven by defence and military requirements. The US military is one of the world’s largest consumers of oil. In 2017, it used over 85 million barrels of fuel to power ships, aircraft, aircraft carriers, combat vehicles, and contingency bases.126 This level of consumption is costly and dangerous because fuel supply lines can be vulnerable to attack, especially in forward operations in combat zones. Even at home, US military bases are increasingly exposed to the threat of cyber attacks, as well as more frequent and extreme weather events due to climate change. In October 2018, Hurricane Michael devastated the Tyndall Air Force Base in Florida. The US DoD is not the only defence organization to explore the potential of renewables. The North Atlantic Treaty Organization (NATO) adopted its ‘Green Defence’ framework in February 2014. The militaries in countries including the United Kingdom and South Korea also plan to expand their use of renewable energy. The energy transition is occurring alongside another revolutionary trend: digitalization. New digital technologies are transforming the energy sector by making it more connected, intelligent, efficient, reliable and sustainable. The electricity sector is at the heart of this process. As the contribution of variable and distributed energy sources grows, digitalization plays a key role in keeping grids balanced. It enables smart responses to electricity demand and blurs the distinction between generation and consumption. However, the growth of digitalization in the energy sector can raise security and privacy risks in the absence of an international rules-based framework. Criminal groups, terrorists, or the security services of hostile countries may hack into the digitalized systems that control utilities and grids, either for criminal purposes such as fraud and theft, or to commit military or industrial espionage. In the most extreme case, cyber attackers may attempt to interrupt, sabotage, or destroy industrial infrastructure, including the power supply. The growth of the ‘internet of things’ (which allows users to connect household appliances, electric vehicles, communications equipment, and the energy infrastructure) provides additional entry points and targets for digital assault. More recently, ‘national security’ justifications were invoked by authorities to prevent State Grid (the world’s largest utility company and China’s largest state-owned enterprise) from purchasing shares in certain electricity networks and utility companies, including in Australia (Ausgrid), Belgium (Eandis), and Germany (50Hertz). While the reasons were never fully elaborated, the assessed risks probably included a high threat of cyber espionage as well as unwillingness to allow a third country to acquire partial control over critical national infrastructure. While the threat of cyber attacks is real, it should be placed in perspective.Cybercrime is a risk that predates the energy transformation. Traditional electricity grids are also exposed to cyber intrusion, while other digital systems, such as banking and the internet, are equally vulnerable. In reality, everything connected to the internet is inherently vulnerable to hacking and cyber weapons. Although vulnerabilities and cyber risks will always exist and evolve, effective counter-measures can be developed and implemented to protect grids and related assets from attack. Grid providers around the world are already taking steps to prevent unauthorized access to energy systems. System operators have established standards to protect the grid, and companies are becoming more vigilant and developing contingency plans to protect against cyber attacks. New smart grid systems are being developed that prioritize cybersecurity in their design. To minimize the risk further, it would be prudent for the global community to take effective steps to develop common cybersecurity norms and rules. Advances in prospecting and mining have also made it feasible to exploit minerals located under the seabed, raising thorny issues of sovereignty and governance.129 As deep sea mining expands, international norms and standards will be needed to mitigate the risks of environmental damage and conflict. However, the largest reserves of metals and minerals required for renewable technologies are found in weak states with poor governance records. More than 60% of the world’s cobalt supply originates in the Democratic Republic of the Congo (DRC). Unaccountable external actors have sometimes caused or aggravated conditions that have maintained lawlessness and conflict in some of these mineral-rich regions, with devastating social, economic, political and environmental consequences. In Colombia, a country in which the longest-running internal armed conflict has taken place, various armed groups have controlled and exploited illegal tin, tungsten, tantalum and gold mining resources. Efforts have been made to address the issue of so-called conflict minerals. Most of these strategies attempt to increase transparency and accountability along the global supply chain. The OECD, for example, has published due diligence guidelines for companies that mine or trade in minerals130 and the UN Security Council has called for such measures to be applied in Cote d’Ivoire, the DRC, Sudan, and other conflict-affected states.131 Well-regulated and transparent exploitation of mineral deposits can make a major contribution to the economic development of these countries. Source: IISD, Green Conflict Minerals, August 2018.